I sometimes like to check up on cases and activities from my iPhone and have a homescreen shortcut to our CRM mobile express site. 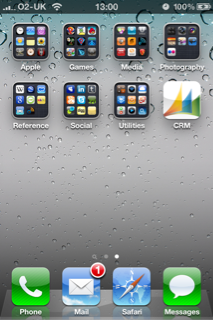 By default, Dynamics CRM does not have an iPhone icon, so I created one for myself here. If you’d like to use it, download it, save it as apple-touch-icon.png and drop it into your CRM web root folder (mine is c:inetpubwwwroot). When you next navigate to your CRM mobile express site, add it to your homecreen and it will display a much prettier icon.